This Virtual Dojo segment comes from an old article of Mr. Heilman's from the late 1980's. The article was published in INSIDE KARATE, and features Mrs. Heilman. The correct use of the tonfa presupposes a background in karate. The moves are essentially the same as karate moves, with the tonfa becoming an extension of the hand or a shield for the forearm. The tonfa enhances blocks and punches by offering greater protection and range. 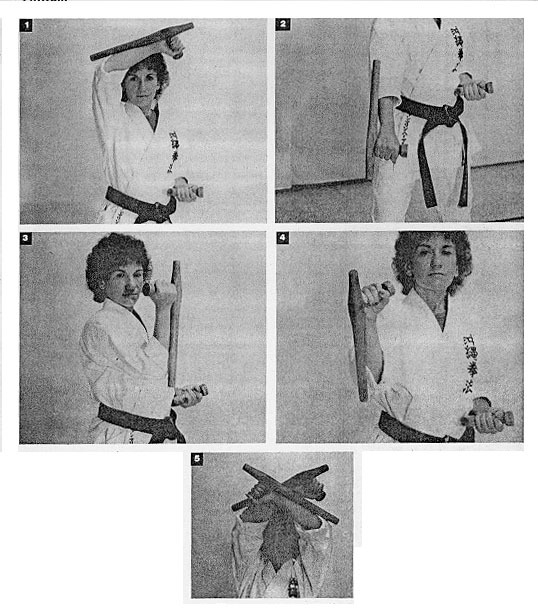 Here Mrs. Heilman illustrates how the tonfa can be used to effectively defend against a weapon which gives the opponent the advantage of reach, such as a bo. Here she demonstrates the open-shaft upward x-block (left) with its application against a bo attack. The striking moves of the tonfa are basically karate punches with the addition of the weapon. The open-shaft strike (1) adds distance to a punch, while the closed-shaft strike (2) is extreemly fast and powerful. The tonfa is gripped in an underhand fashion for security. It can also be used to deliver a hammer strike (3). Closed Shaft Blocks - All colsed-shaft blocks require the shaft of the tonfa to be kept in position to protect the forearm during the final phases of the blocking movement. The idea is to use the weapon to protect your arm, not your arm to protect the weapon. Mrs. Heilman demonstrates the five basic blocks: upward block (1), downward block (2), outside block (3), inside block (4), and overhead x-block (5).